being average: How To Become a Gate Topper ? How To Become a Gate Topper ? 1. Check topics from this post. This is the most important subject according to GATE point of you. Approximately 25% Questions in Gate come from above topics and all are related with each other. 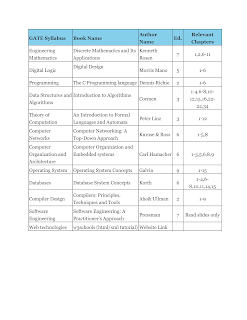 If you are good in this subject this will not only help you in GATE but also after it in so many written exams and interviews of Different IITs and IIITs. C programming Questions are mostly based on finding outputs which contain some pointers, static variables, arrays, strings, functions etc. So the best way to practice C programming question is take questions from different books, try to solve them and try to do programming on Compiler. It will increase your skills and accuracy. Very high chances of common data questions. So if you are not good at programming start practice from now. Understand Different Problems on Stack, Queue, Link List. Generally they come in a C program, But you can solve them only if you know the logic. Properties of Heap. Deletion and insertion of items in the heap. Practice Tree problems like no of leaf nodes, non leaf nodes, total nodes, height of the tree, no of full nodes, mirror image, etc. AVL tree and balancing them on insertion and Deletion. Binary tree, Binary Search Tree, Inorder, Preorder, Postorder traversal. Spanning Trees, Minimum Spanning Tree problems. Very Important Topic. You need to practice more and with every problem you solved. Sometimes direct question comes related to complexity like give complexity of Heap sort. But mostly you are given a code or question. You need to find best average case complexity of that problem. So try to find complexity of every algorithm or program which you practice. Also understand properties of complexity. Sometimes relation between them is asked. Searching and Sorting Problems. Difference between Different Techniques and how to apply them on different real life problems. Questions on approach of dynamic programming, Divide and Conquer, Greedy and Brute Force. Practice basic problems like quick sort, merge sort, knapsack problem, matrix chain multiplication, LCS, Job sequencing, Compressing Mechanism. It will help you to solve other tricky problems. around time and waiting time of different scheduling policies. related to semaphores and classical problems of synchronization (this will help you to solve other questions). automata, Recursively enumerable sets and Turing machines, Undecidability. • Finite Automata covers approximately 50% questions from TOC. So give it more time then others. Do questions realted to finding minimum number of states, NFA to DFA conversion, Closure Properties of finite automata, Finding Regular Expressions,mealy moore machine etc. • In Context free grammer practice more on simplification of CFG, pushdown automata, closure properties etc. • Do problems on finding category of any language or grammar. • Concepts related to expressive power of different languages. • Basic problems related to NP-Completeness. Properties of Recursive and Recursive Enumerable Languages. • Turing Machine making and expressive power of different type of turing machine. ( also useful for interview ). • Precedence and Associativity of operators. • Finding value from expression tree. • No gate paper completed without Normalization. This is very easy once you understand and can solve questions quickly. Questions are like Finding normal form ( comes 70% times in gate paper ), finding candidate keys, decomposition of relation, loss less join and dependency preservation have more probability to come. • Practice joins because there is more probability of tricky questions from them. like deadlock freedom, starvation freedom. minimum and maximum no of nodes in B,B+ trees. sequential circuits; Number representation and computer arithmetic (fixed and floating point). right way you can do them easily. • Practice Multiplexer, De-multiplexer, Encoder, Decoder questions. • Understand concept of flip flop. They are given and modulas of counter is asked. ieee format, range and precision. Cache and main memory, Secondary storage. key cryptography, digital signature, firewalls. Sequence bits, frame size, bandwidth, round trip time, utilization, Hamming Distance, CRC. Congestion Control policies like slow start, congestion avoidence and Congestion Detection. • IP Header , TCP and UDP header format, theory related to Ethernet and token ring. 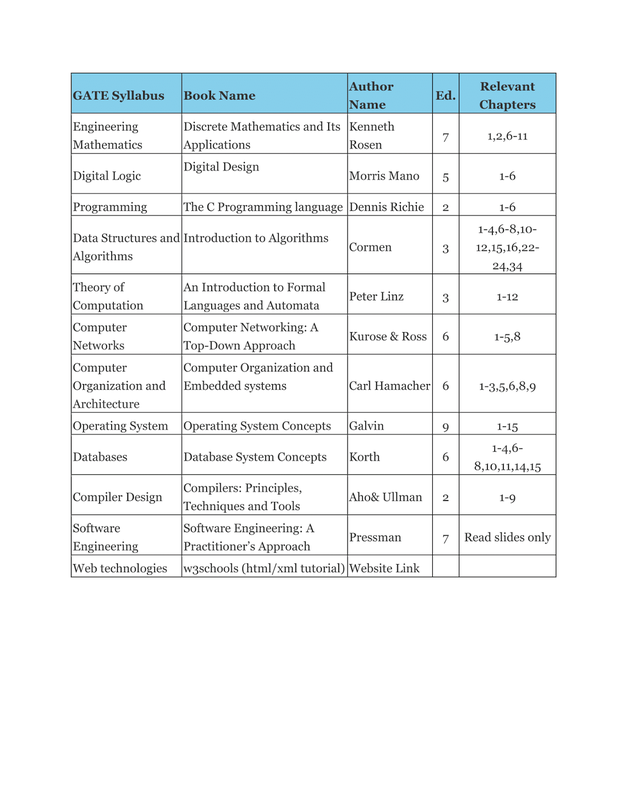 • Basic Concepts of Cryptography and firewalls. project, design, coding, testing, implementation, maintenance. this subjects or prepare yourself. • Numerical Problem may come from COCOMO model, cyclomatic complexity etc. • Study Different Models and there properties along with difference between them. Data flow Diagrams are also important. matching; independent sets; Colouring; Planarity; Isomorphism. Eigen values and Eigen vectors. Raphson Methods; Numerical integration by trapezoidal and Simpson’s rules. derivatives, Total derivatives, maxima & minima. and poisson distribution, mean and variance of different distributions. and some tricky problems which need practice to solve them. like infinite no of solutions or unique solution. differentiability. Finding values by Mean Value Theorem. Integration. Diagrams, Group Theory. Sets Related Questions. 9. Simple problems on logic. instructions, critical reasoning and verbal deduction. Ordering of words, sentences etc. man out, Boats and pipes etc. ONLINE PREPARATION FOR GATE is aided by ONLINE GATE PRACTICE TEST that is BEST GATE ONLINE TEST SERIES that allows ONLINE TEST FOR GATE PREPARATION. This BEST TEST SERIES FOR GATE allows ONLINE GATE PRACTICE TEST is and there also FREE ONLINE GATE TEST SERIES. The gate academy started coaching classes for GATE exam. Be ready for the most competitive exam in the technology field. All the best guys.